Creek Crossing Farm - Northern Virginia Bed & Breakfast - Loudoun County, VA.
Nestled in a secluded valley just outside the present day village of Lincoln, Creek Crossing Farm has been offering gentle hospitality to all who have come here since the early 1770’s. The old Colonial road passes through the farm, and you can still see traces of it in the gentle contours of the land. It passes the veranda-fronted house on the hill, now the welcoming Bed and Breakfast, the remains of the old stone barn, destroyed during the “Burning Raid of 1864”, slips over the creek, glides up the hill and back into the 21st century. Over twenty-five acres of open fields and pasture house a flock of sheep, and in the woods, there are wild turkey and deer. John Singleton Mosby, the ‘Grey Ghost’ rode here with his 33rd Battalion and a hidden stairwell in the old sitting room attests to the sentiments of the Quakers who lived here and secreted the passengers of the Underground Railroad. Creek Crossing Farm is available for the use of small parties and we graciously accommodate children and pets. We also have special rates for long-term guests. We can offer special accommodations for bicyclers from the nearby W&OD Trail ( 2 miles from here). We want you to know that there are two resident cats and one Jack Russell Terrier on the premises, as well as our fat and sassy flock of chickens, to welcome you and enhance your stay with us. We know and work with our local farmers and you will find their farm-raised meats and glorious cheeses on our breakfast tables, along with maple syrup from our own Blue Ridge Mountains. In summer, our Breakfast menus feature fresh-picked peaches, plums, apples and pears, served with the unique breads made in our own ovens. In winter, their bounty reappears as jams, jellies and conserves. Our updated menus feature meals carefully crafted by the owner/chef and reflects many culinary disciplines. Breakfast may feature a French Souffle, joined by an Italian Filone, Tuscan Eggs, or Danish Pastries. In season, we serve breakfast in the garden, on the porches, or overlooking the fish pond. We accommodate special dietary needs, and early departures can take their farm-fresh breakfast basket along with them. Breakfast at Creek Crossing farm features eggs from our best layers. 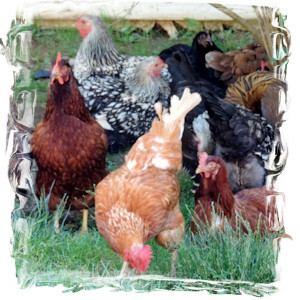 Uncaged and Free Range! 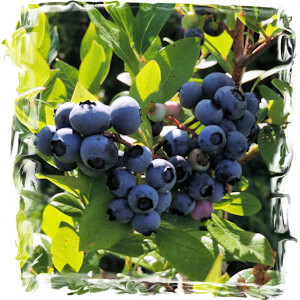 Over an acre of Blueberries provides a sweet treat from June through July. 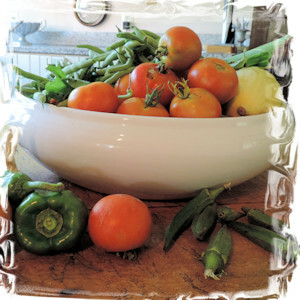 We prepare our meals with fresh vegetables from the farm, in season! 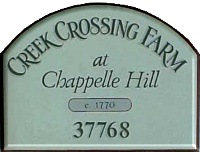 Copyright Creek Crossing Farm © 2017.